Entering its third season, 'Market on the Square' is now accepting applications from vendors interested in participating in the popular seasonal market on Fountain Square. 'Market on the Square' runs every Tuesday, over the course of the summer months (21 weeks) from 11am to 2pm, and attracts thousands of visitors and shoppers each season. 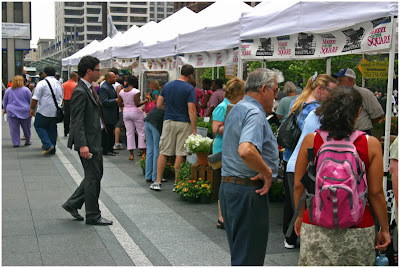 Last year's vendors sold fresh produce, baked goods, prepared lunch foods, fresh flowers, handmade items and more. Interested vendors are encouraged to apply now after reviewing the Vendor Application for selection criteria and important instructions on how to apply. The Fountain Square Management Group notes that all vendors must apply by April 2, and that no more than 24 vendors will be selected two weeks later. Attacks thousands of visitors? The vendors have never been anything but nice to me. This is distressing. I hope the market doesn't attack thousands of people!!!!!! Whoops, that was an unfortunate typo. Thanks for the heads up. sounds like a place for suburbanites who are too nervous to travel into OTR to go to our city's REAL market. What a joke. Well it is tremendously more convenient for Downtown workers as compared to Findlay Market which would be an unreasonable distance to walk over a lunch break due to time. Once the Cincinnati Streetcar is built that inconvenience will disappear and instead of being an unreasonable walking distance from Downtown workers on their lunch break, Findlay Market will be just a short ride away on the streetcar. "start working in more interesting typos"
yeah, the lunch time hours make perfect sense. I used to hit Findlay Market on my lunch break all the time when I worked nearby. Since the neighborhood markets are usually open later in the day, the vendors can do 2 markets in a day, too.